Now how about tooling up for some late body parts, like 26/27 runabout bodies? There just might be a demand out there? So the rodders won't have to cut up originals..
Holy cow! 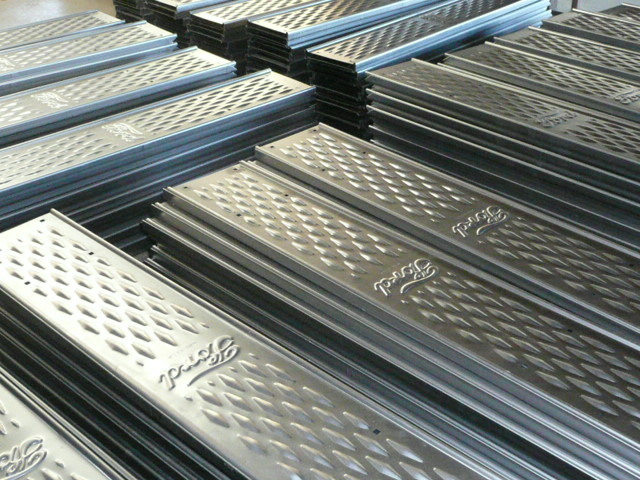 That's a lotta running boards!! Over the years, I have bought numerous fenders, hoods, and ect from Rootliebs. Each one was a work of art. Keep up the great work!!!! I agree David, the body parts from Rootleib's shop are top quality. Chris. Being past and future customers, Sandy and I called into Rootlieb's last January and were shown around the factory by Tom. Its an amazing place producing top quality products and we were made to feel completely comfortable when Tom showed us his own personal collection of (not just) Model T cars & parts. We were also shown a single piece of flat steel being pressed from a flat into a finished '14 hood handle...which was given to us as a memento. Probably not rating very highly with a lot of folk, that visit was something I'll never forget. Top Company, Rootliebs.......Top guy, Tom. Woah... Are some being sold as steps for a ford themed staircase in a building? So many running boards. What's really amazing is that there is enough demand for them to make that many--and to invest in the stamping machine to do them! Running boards aren't that thin of material! Very darned impressive. _Guys like Tom Rootlieb are the reason there will always be Model T Fords on the road. _Uh... any chance for a little repro running-board toolbox with a key-lock? WOW!!! Kinda makes ya feel warm and fuzzy to know its going to be available. Thank you all for your kind words. When I walked by that scene, I thought some of you would enjoy it. However, being a fan of lots of things mechanical, what came to my mind as I was in the midst of producing those stacks of running boards, was that in Jan 1863 just down the road in Sacramento, the first rails of the Central Pacific were being laid to head east. Six months later a child was born in Michigan who would have his own effect on transportation. And now, 152 yrs. later, here am I feeling that effect every single day of my life. Now, that is what I call impressive. Were there no Henry Ford, who knows where I would be. I forgot to add that what you are looking at are 1913-25 boards. What you see in the picture, would NOT have lasted till lunch time on the assembly line. Think about that one. Tom: Sure would like to see some of the equipment used to produce some of the T parts. I promise I won't compare it to what Henry used. In fact they wouldn't have lasted 2 hrs when they really got rolling.